Threshold Ramps to improve wheelchair access. Quick and easy permanent installation using construction adhesives. Can also be used as a portable ramp. Moulded from slip resistant recycled rubber. 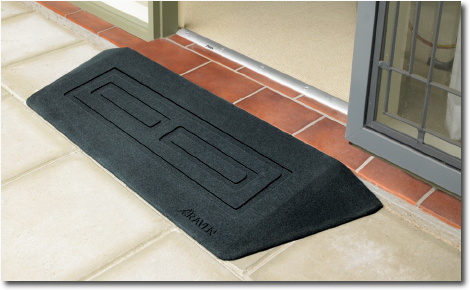 The Raven threshold ramp available in two sizes is the simplest most affordable solution for homes, work, shops or professional practices.The simplest way to increase access to any area or used as a portable aid. The threshold ramp is easily trimmed to fit and meets access and mobility gradient requirements. Either ramp model can be cut to reduce the height to exact requirements (see images). The larger model is built for very heavy duty.